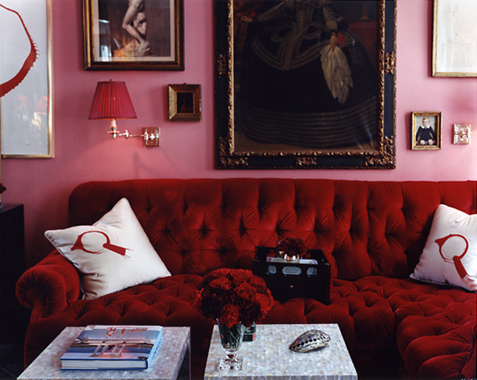 Pink is thought to be calming, soothing and resonant with unconditional love in feng shui color theory. My recent obsession with painting my entire home in shades of pink (oh, I am just days away from pulling the trigger!) prompted a more complete investigation of pink in all of its psychological implications before I grab my roller! Color Intensity Makes a Difference: An interesting fact about color intensity is that deeper colors stimulate emotional responses and lighter colors promote more intellectual, aesthetic responses. Deeper, brighter colors add CHI or “life force” to a room whereas lighter pastels hold onto the existing energy of a room. Pink is a very broad term. There are hot pinks that I would categorize more as magenta and would deem undeniably as potent as red in raising blood pressure, excitement levels, alertness and possibly even promoting insomnia and arguments. These deep, rich hues also have the greatest potency in creating positive change. Its a balancing act. Too much deep color in, say, your bedroom could spell disaster. However, in a living room designed for lots of activity, rich pink walls could be the best feng shui decor element of all. Where You Put Your Pink: In feng shui theory, where you add intense color you will create change in that corresponding area of life. Feng shui teaches that every area of your home is symbolic of a part of your life. 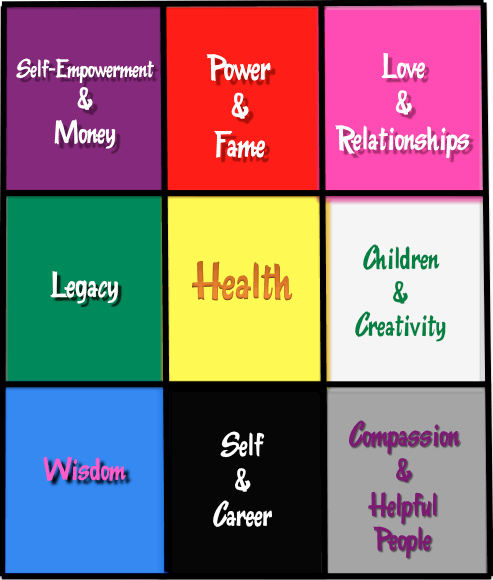 If you look at the Bagua Map you can see what areas of your room or overall floor plan of your home correlate to the feng shui areas of your life. For example, if you place purple in the far left corner of your room or home, you are directly “stimulating” the Money & Wealth portion of the space. Intense color will create intense change. In all senses, I say go slowly on the pink mission. Although I want desperately to paint my entire home in shades of pink, I am planning to layer hues to add more earthy pink beige (which will bring stable earth energy as well as fire energy to the space). In this way, pink can be the energizing tone that prevents beige walls from becoming depressing and dull. Phases of Integrating Pink: If you are starting on a color escapade, an inexpensive and impermanent way to add pink is to start with vinyl decals. I found bloom colored damask vinyls on Etsy and put them up in an evening in my dining room. 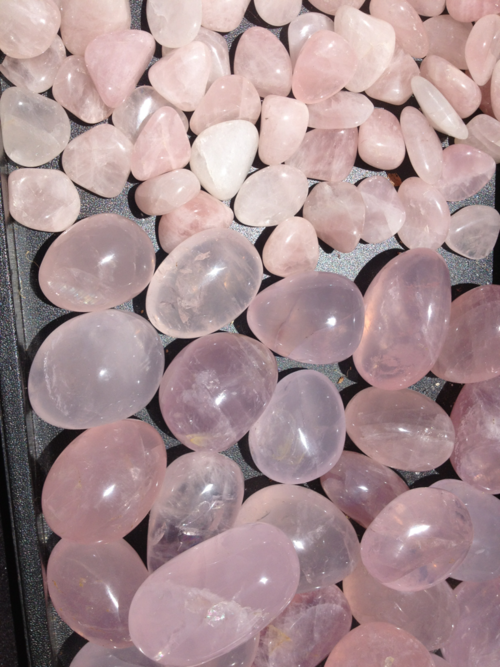 Another way to see if you are feeling the vibration of pink is to get a hunk of rose quartz and plop it in the area you are thinking should be pink and see how that makes you feel. For me, a pink crystal was the tell-tale addition that launched me on my pink mission! Special Notes on Pink: Bubble gum pink has been found to be soothing, enough so that prisons have used it to subdue prisoners. Conflicting studies revealed that this tranquilizing effect wore off after a short time and further aggravated aggression. There is also lore that sports teams paint their opponents locker rooms in pink to subdue their aggression, though I will need some professional athletes to verify this for me! Pink is a If you are interested in personal energy fields of our bodies which have been termed chakras, its interesting to know that the “pink” chakra is a smaller, “extra” chakra that lies just below the heart chakra on the body and correlates with unconditional love for oneself and others. In chakra-speak, if you add pink to your life, you can amplify your energy in this area of your body. Very cool stuff! Plush Pink Decor With Personality!